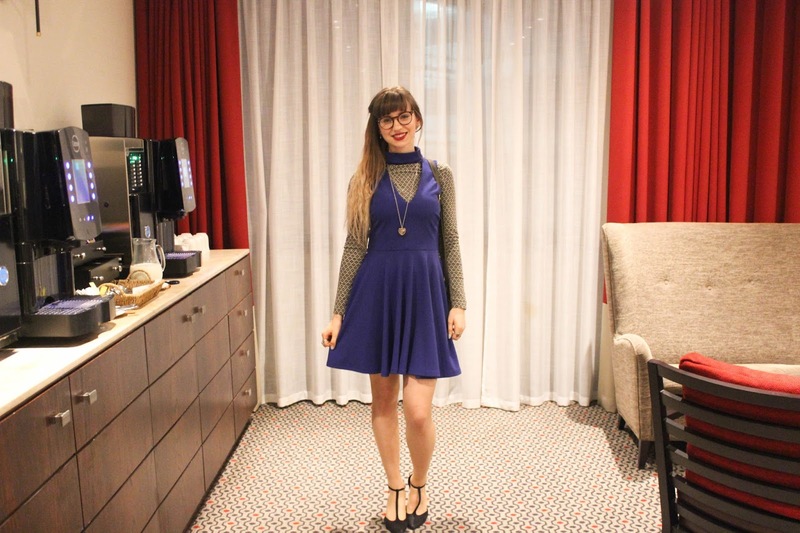 In January I was lucky to be invited to a posh Murder Mystery Dinner hosted by poshflooring. When we first arrived we were greeted with a champagne reception and got some pictures taken. Some of the best Yorkshire bloggers attended the event including the lovely Lucinda, India, Gabby, Corinne, Ally, Laura and Dash. I was really in love with my outfit for the evening and that's probably because I borrowed it from Gabby's wardrobe! I was actually wearing a very tight outfit and decided I needed something a little more comfortable to hide the food baby! After the drinks reception were led to the main room where the three course dinner was going to take place. The tables were set beautifully and we did indeed all feel very posh! Once we got settled in our seats and started getting excited about the food the door burst open and a man fell dead on the floor! Sherlock Holmes made an appearance explained that the dead man was the victim of a murder. They gave us a range of investigation forms and tools to uncover who commited the crime. Whilst having really delicious food ( I was so so impressed and had one of the best gluten free desserts to date!) we chatted quietly among ourselves trying to piece the story together. The event was very fast paced which made it very exciting. Before we knew it we were called to give our verdict and we WON!!! We were asked to come and dress as the suspects and act out the murder scene which was really great fun. Before we left the event we were generously given with some lovely gift bags full of goodies to help us stay posh and relaxed once we got home! I have to say this was the most original and my favourite blogger event I have attended to date thank you to Poshflooring for hosting such a fabulous afternoon! I've always wanted to host a Murder Mystery party! Seems like so much fun! !